This was the first time I had been in Rhode Island and Providence Plantations in some time. 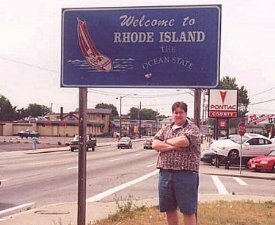 After we realized that it was much quicker to get to Maine from New London, Connecticut, via I-395 and I-290 rather than through Rhode Island, I hadn't set foot in the smallest state in the universe � I mean, United States � in probably about 12 years. 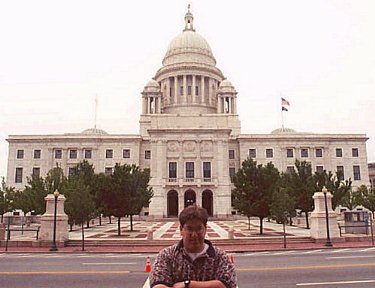 This picture was the second one I took in this quest, the first being the capitol in Boston, Massachusetts. This was before I got past my initial timidity about pulling off the side of the Interstate and snapping a picture. I followed US-1 down from Boston since I wanted to drive by Foxboro Stadium. Getting back on I-95, I found an absolutely enormous "Welcome to Rhode Island" sign. It was great. The problem was, it was in the median of I-295. I thought about getting in trouble should John Q. Law happen to drive by, so I chickened out. I got on I-95 and found myself soon in Pawtucket either without seeing a sign or its being too small or out of reach. I don't know if I looked past it or didn't consider it, but wouldn't it be hard to get pulled over by a cop when you're on the state line? If it's a Massachusetts State Police Officer, what is he doing driving into Rhode Island? And if it's a Rhode Island Trooper, what is he doing in Massachusetts? What made it seem more like a lost opportunity in retrospect was that I was there around 8 AM on a Sunday. There was no traffic! So I pulled onto US-1A and drove from South Attleboro, Massachusetts, into Pawtucket, Rhode Island. I drove up and around a development looking for a place to park rather than just pulling off, hopping out, taking the picture, and being on my way. Next time I'm in Boston I will get that good one on I-295. My friend Vanya calls me GPS ("Global Positioning System") since I have a keen knack for navigating. Providence was one of the rare times when my internal GPS failed me. I saw the dome of the capitol and drove toward it. But Providence is a maze of one-way streets and poorly-timed traffic lights. It's also very hilly. So you'd drive down a hill, sit at a red light, go on to the next one, wait at another red light, make a left, drive down a block, sit at another red light, can't make a left since it's a one-way street, and so on. It got so frustrating that at one point I got out of my car and walked. But for some reason, I could not zero in on this dome. After about 45 minutes of tooling around, I finally came upon it. It was a small building in a residential zone. Turned out that I was in East Providence the entire time, and the rotunda I was chasing was not the statehouse of Rhode Island and Providence Plantations, but a church. In the midst of my search when I was on foot, I walked across the Providence River into Providence. I saw a number of informational signs, mostly detailing Providence's encounter with the Long Island Express, also known simply as the Hurricane of 1938. I looked all over but couldn't find anything about the capitol. I don't know if I had been misreading the map the whole time, or if the resolution of the small Providence inset was just too small. I was on my way out of town when I caught a glimpse of the real Rhode Island capitol. After negotiating some more one way streets, I found it, near US-44, on the northern end of the city. Note the grimace. The capitol is impressive for a building its size. I didn't much investigate it, having spent too much time in Providence as it was, but it had a uniform off-white color like that of marble or sandstone. The two small domed windows that hold the flagpoles top what are probably the assembly and senate chambers. Just to the left of this picture there are a few warning signs that say "Capitol Police" and what looked like and underground garage. It almost seems like overkill because hey, this is just Rhode Island, but it does lend a certain air of legitimacy to this building's being the seat of state governmental power, signs that weren't apparent in states like, oh, Delaware. So after snapping the picture, I was on my way to Connecticut, leaving behind the shame of my experience in Providence. But I did find it eventually on my own. And asking directions is an offense punsihable by death as far as I'm concerned. Just can't shake the feeling that if I had just posed in front of that median sign on I-295 and hopped on I-95, I would have come around the west side of Providence and gotten just where I had to go. This page loaded in 2.526 milliseconds.